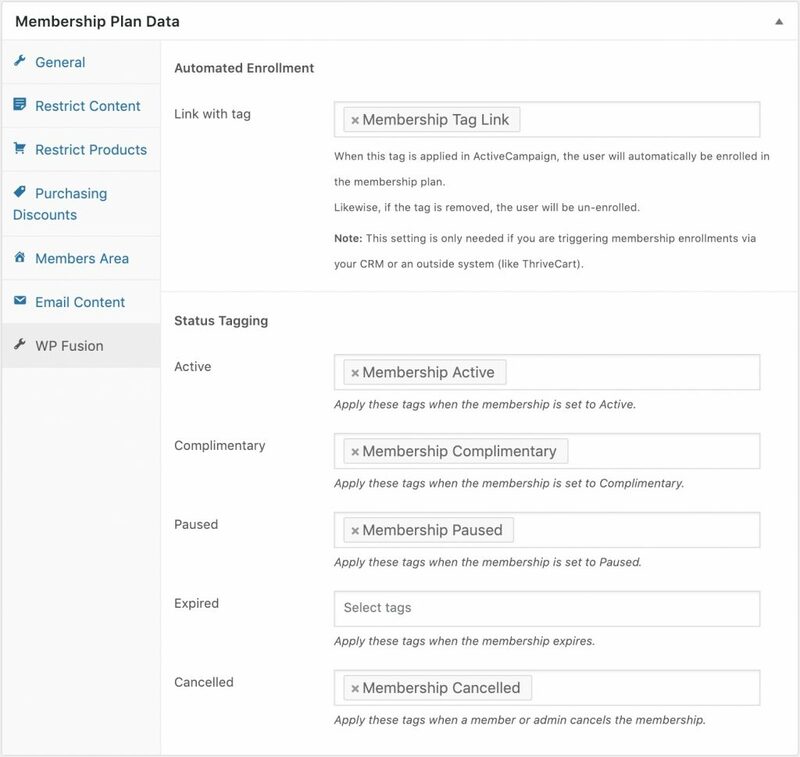 Using WP Fusion with WooCommerce Memberships, you can apply tags based on the status of a membership, as well as automate membership level enrollments by applying a tag in your CRM. To configure the settings, navigate to WooCommerce » Memberships » Membership Plans, and click Edit on any membership plan. Here you can configure tags to be applied when a membership’s status is changed. For more details on the meanings of the statuses see this documentation from WooCommerce. If you’re using WooCommerce Memberships in conjunction with WooCommerce Subscriptions, and you’ve already configured tags for the subscription product, then there is no need to specify additional tags here. You can automate enrollments in a membership level by specifying a “linked tag” in the Link With Tag box. If this tag is applied to a user, they will automatically be enrolled in the membership. Likewise, if this tag is removed, their membership status will be paused. When a user is given this membership level, either via a WooCommerce purchase or manual assignment, the selected tag will also be applied. Note: This is only necessary if you are selling membership access via an outside system (like ThriveCart) and wish to automatically set and pause membership levels. If you’re selling access via WooCommerce it’s preferable to configure any tags to be applied via the WooCommerce product. WP Fusion also supports syncing a member’s expiration date to a custom field in your CRM. To set this up go to Settings » WP Fusion » Contact Fields and enable the field Membership Expiration for sync. When a membership is purchased or changed the expiration date will be synced.